Nihonga (Japanese-style painting) is an ancient art form based on traditions and techniques over 1000 years old. 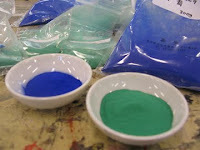 It is typically executed on washi (Japanese paper) or eginu (silk), using sumi ink or pigments from minerals, shells, corals, and even semi-precious stones like malachite, azurite and cinnabar. The pigments are ground into 16 gradations from fine to sandy grain textures. A hide glue solution, called nikawa, is used as a binder. Nihonga is known for its delicate washes and pure, luminous color. One specific hallmark is the way in which light is captured and bounces off the edges of the various ground edges of the mineral pigments allowing the various built up layers to play off each other. This blog represents notes taken during a recent class at Regent College in Vancouver given by Makoto Fujimura, a leading Japanese-American Nihonga painter. 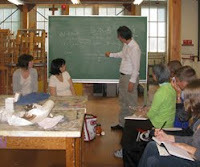 It only addresses specific processes and techniques as they might help the individual Nihonga student and is not meant to be a full treatise on the art of Nihonga painting. Please feel free to use this information as you wish. However these notes are not meant to be published outside this blog except for personal use. Please feel free to add on to these notes based on your own Nihonga experience and understanding in the comment section. The main goal of this site is to exchange information and learn more about the process and how it's being used. 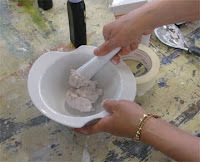 Gofun is made from ground oyster shells and has many uses in Nihonga painting. Different kinds of gofun are used as a ground, for under-painting, and as a fine white top color. You first need to really grind the white powder. We did it for about 10-15 minutes in class. *It is good to use fresh glue. The gofun will last longer. When you can no longer stir it, scoop it up with your hand and form it into a ball and start kneading, picking up as much from the bowl as possible. Now you begin to pound it or throw it down forcefully in your bowl several times. (similar to making Chinese fish balls). What you are looking for is the ball to feel like your ear-lobe, smooth and slightly moist. This is called the “hundred times” technique because you need to throw the ball many times. Form into “snakes.” They should be able to be rolled out and not break. You can let the snakes dry right now and use them later, reconstituting them with a little water. They last pretty long. Or if you want a nice bright luminous white, cover the snakes with water and let sit for a little while. At least 20 minutes…can be longer. Some artists let them sit overnight. Dump the water out and cover with fresh water (just enough water to easily cover the snakes, we were using a little too much water in some of the batches we made in class) and then heat, gently bringing up to a simmer (not a hard boil but hotter than when making the glue). Let it simmer for about 5 minutes. Take off the heat and let it sit for a few minutes. Now begin mixing it with your finger. Sometimes it feels gritty, keep working it until its nice and soft and without any lumps. Now let it sit a few minutes and the layers will seperate out. The very top layer looks like thin milk and is the finest translucent white, good for top painting, very luminous. The next layer is the consistency of gouache and is good for more opaque painting. The bottom layer is thicker and a little more chalky looking. It is good for underpainting and grounds. You can use this for quite awhile. The top silky transparent layer you should use fresh or it will lose some of its transclucency. The other layers can dry out. 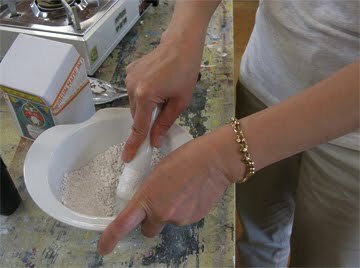 Then grind it up a little again and reconstitute with a little water and keep using. Crack sticks (be careful, they are quite brittle, wrap them in a towel before you break them to be safe). 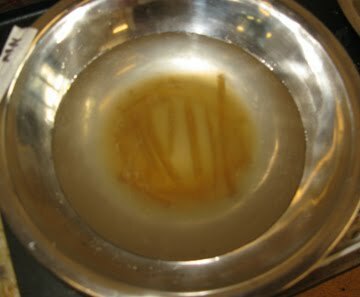 We used 3 sticks to about 1/2 bowl of water. Glue will last about a week if you refrigerate it. It will go bad though, you will know this by the distinct odor. Soak overnight (you can speed this up by putting them on a low heat...be careful to not overheat or boil as it breaks the glue apart). We used metal bowls in class but its best to use some kind of pyrex or even a slow cooker. 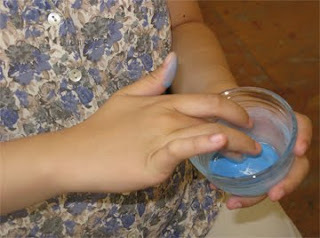 When the glue has softened from soaking, heat it gently making sure it doesn't boil. If you have a slow cooker you can use that. I got one from the goodwill store and that has worked fine. The reason they are good is that they don't get that hot. But you can also do it on the stove burner or electric griddle....just watch it carefully and do it on low heat. Filter the glue before you use it. We used coffee filters in class. Its actually good to paint with the glue a little warm....that is why something like a griddle is nice because you can periodically return it back to the griddle to warm up. Or if using a slow cooker, leave it on the lowest setting while your working and it will keep it gently warm. 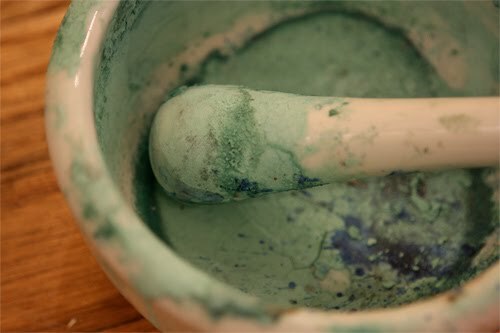 If you don't have these then you might want to return it to the stove burner periodically to warm it up....especially when you are in the process of mixing it with pigment. If you refrigerate it it will become gelatin again, just reheat it. You can reheat as much as you want without hurting the glue...just make sure not to boil. Gently crease the edges of the paper to know where you want to tear. You can actually figure this out whatever way works best for you, Mako did it by folding the paper slightly, you could also measure it. The goal is to have some guide for your straight-edge without marking or creasing the paper to any great extent. Using a straight-edge (in class we used a board because we didn't have anything else but a metal ruler works well, wet the edge you want to tear with your brush. Using a "bookbinder's bone" score along the straight-edge (do not cut or tear completely through the paper). Gently but firmly pull the two halves of paper. You will see the fibers feather on the edges. Typically use hake brushes for broad washes and thoryu (? ), a natural hair brush that comes to a point, for fine lines. 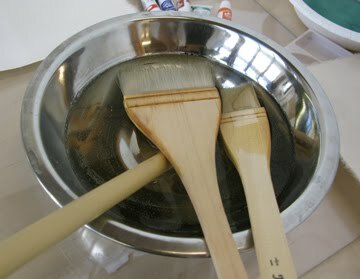 Set your brushes in water about 1 hour before using (some artists let them sit overnight) This allows the brush to fully absorb the water, "coming alive" and "broadening out." Don't force the brush when it's not ready or you can damage and lose the hair. In class we used Kumohada paper, a high quality Japanese paper that is fairly expensive and must be ordered directly from Japan. This is a traditional paper to use with Nihonga and its even texture and consistency accepts the paint well. 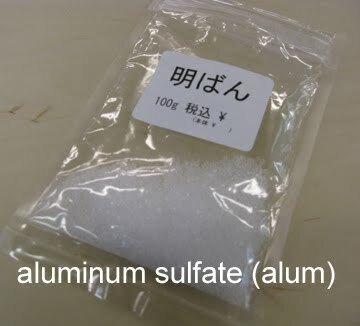 However a variety of papers and substrates can be and have been used with Nihonga. 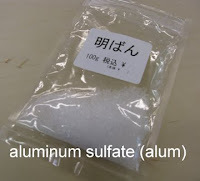 Japanese paper is especially good because the Japanese technique for papermaking manipulates the layers of long fibers of the paper pulp in such a way that they interlock, creating a very strong paper. Also the hand-made paper is typically not made with chemicals and is therefore archival. However many western and machine-made papers are also suitable once they have been sized with dhosa. Here is a video showing how Japanese paper is typically made. Whatever paper you use, take it out of its packaging once you get to the studio. Paper needs to adjust to the air and environment and should not be tightly rolled or encased in plastic. Gofun - powdered calcium carbonate that is made from cured oyster, clam or scallop shells mixed with nikawa is used as a ground, for under-painting, and as a fine white top color.